Swimmers paradise! Piscines Bernat Picornell is exactly where a swimmer in Barcelona should find himself. There’s an indoor and an outdoor pool here. The pool is actually an Olympic venue with about 15 lanes. It features a Jacuzzi and a sauna room too. You could plan an entire day of swimming here. The water is clean and the toilets are hygienic. You could also relax on the chaise lounges lined up on the sunny side. Visit the official website for additional details on timings. 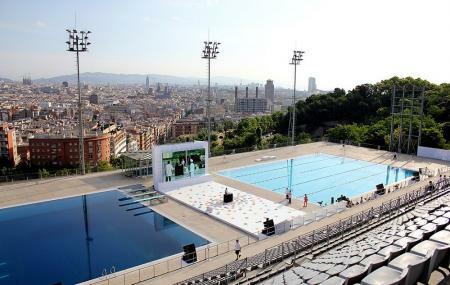 How popular is Piscines Bernat Picornell? For a swimmer the '96 50m Olympic Pool is a great visit. However at €12 for a swim it is very expensive. There are 20 indoor 25m lanes if you are so inclined but an open water swimmer will likely always choose the Lido. Lockers cannot be locked unless you bring your own padlock. I have only been here one day, but the facility in extensive and impressive, as far as location, amount of exercise rooms and facilitated classes. There are two levels of locker rooms, for men and women. Indoor and outdoor pool. Multiple saunas, steamroom and hottubs. The equipment is nearly brand new in the workout centers, they have a space specific to many of their acitivities, (yoga/taichi, cycling, core, crossfit, ect). There is a cafeteria, and more that I have yet to explore. This is a massive place. The only issue is that the locker rooms could use some more attention. Excellent swimming pool. The rest of the spa facilities could be maintained better.